Prosectutor General Tarek Saab made the announcement on Saturday, saying that Jose Luis Rodriguez, deputy director of the prison, was among those detained. 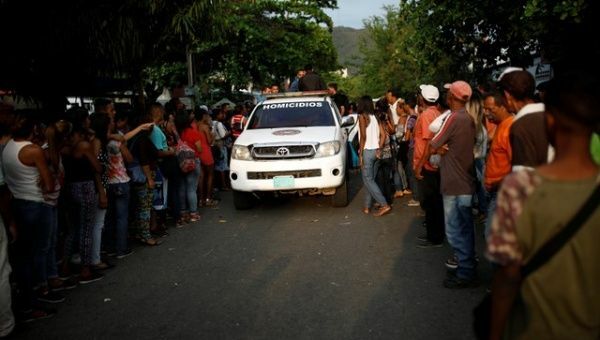 March 31 (teleSUR) Venezuela has arrested five prison officials in connection with the deaths of 68 inmates at Carabobo State Police detention center in the northern city of Valencia during a riot and subsequent fire on March 28. Prosectutor General Tarek Saab made the announcement on Twitter on Saturday, posting that Jose Luis Rodriguez, deputy director of the detention center, was among those detained. “Five officials from the Carabobo Police, suspected of being responsible for the tragic facts that caused the death of 68 citizens in the regional police detention center: already detained,” Saab posted. In a statement issued Friday, the government sent condolences to the victims’ families and announced a full investigation would be undertaken by the Public Prosecutor’s Office. “The Government of the Bolivarian Republic of Venezuela, in the face of the tragic events that took place in a detention center of the Carabobo State Police on Wednesday March 28, 2018, sends its heartfelt words of condolence to the families and friends of each one of the people who died in this unfortunate event, at the same time a request has been sent to the Public Prosecutor’s Office, the beginning of an investigation to search for the truth, in order to determine the causes that caused this painful event, as well as the possible responsibilities to those that may take place and the implacable and firm application of justice,” the release read. Venezuela also harshly condemned the “hasty and disproportionate statements made by the Office of the United Nations High Commissioner for Human Rights,” saying that the body made the comments without conducting any investigation or receiving official information from Venezuelan authorities. From Geneva, the United Nations had called on Venezuelan authorities to carry out a speedy investigation and provide reparations to victims’ families. Venezuela’s Foreign Ministry said those comments betrayed “bias” and were part of a “multi-pronged attack” against the South American nation. The statement did not give any details on the cause of the disaster, which inmates’ relatives and a surviving prisoner told Reuters stemmed from a shoot-out with police in the jail. The federal government, along with authorities from the state of Carabobo, have formed a multi-discipline team tasked with providing protection and care for the victims’ families.